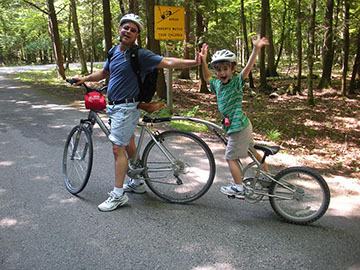 There are a great number of activities at Peninsula State Park and I think the Sunset Bike route is a good choice for novice and intermediate riders. The Sunset route is 9.6 mile ride and plenty of places to stop and snack. I would allow 3-4 hours to do the loop and have lunch at Nicolet beach. We generally start about 9:00am from Baileys Harbor and hit Nor Door rental in Sister Creek about 9:15 am. Bike rentals start at $6 per hour and full day rentals starting at $25. We get our bicycle and helmet fit by size, provide a credit card for deposit and we are out the door. From Nor Door we quickly cross Route 42 and we are in “Julies Park Café & Motel” parking lot and then through the gates of Peninsula State park. There is no cost or pass needed to enter the park since we are biking in. You can rent bikes and kayaks at Nicolet Beach Concessions but you will need a Wisconsin State Park parking pass (daily or annual). The Sunset route is a mix of crushed stone, dirt and pavement. The loop goes near Green Bay lake shore and through cedar and maple forests, past camp grounds and Nicolet Beach. The beach is a little more than half way. It’s a great place to break for an early lunch. 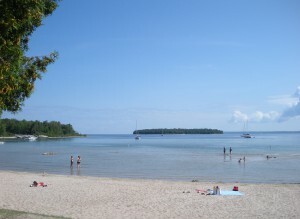 There are plenty of picnic tables, bathrooms and view of the lake and Horseshoe Island. The second half of the trail has some exciting downhill areas and you ride past the Peninsula Players theater. Afterwards we return the bikes to Nor Door and head to Sister Bay to do a little shopping and then hit Wood Market for some fresh corn on the cob and head back to Baileys Harbor to get cleaned up and plan out our afternoon. Perhaps a hike through Tofts park, swimming in the pool or off to do a little shopping before dinner. Jacob G. Schmitz, and his wife Sophie (Bischoff), were the first owners of the current property in the early 1900’s. Jac was a deputy sheriff of Milwaukee County and Sophie was a nurse. Together they owned and operated Jac’s Beer Garden and Restaurant in Milwaukee, serving working local people. When Jac was advised to visit the Baileys Harbor area, they immediately fell in love with the beautiful landscape and sunsets and purchased a building near the lake to use as their summer home. There was nothing in the area, but the Underdunks home and the US Life Saving Station, and its crew who lived nearby. Jac, Sophie and daughter Irene, felt this was truly God’s country and shared their home with many family members and friends. When Sophie died in 1925, Jac and Irene moved here permanently. Jac, with his younger brother George, purchased several homes from the Life Saving Station , and Bill Tishler Sr. was contracted to construct a main building consisting of a bar, dining room, kitchen & office. The dream of a resort became a reality when “Schmitz Gazebos” officially opened in 1935. Jac Schmitz was a kind, thoughtful person who brought the poor of the Milwaukee churches and schools here for a free vacation. Each time he drove this car up, he brought loaves of rye bread, long sticks of summer sausage and watermelon for the people he knew in Door County. His outgoing personality and keen business sense made the resort an instant success. He and Clarence Mann were also responsible for having a road cut through the woods from town, now known as Ridges Road. Jac died in 1940 at the age of 60. George and Irene kept Schmitz Gazebos running smoothly. The area operating as the Life Saving Station merged with the US Coast Guard…a few sailors even trained at this site prior to being assigned to ships in the Atlantic Ocean during WWII. When the Coast Guard Station closed in 1950, George and Irene purchased the remaining houses and built 12 more cottages so the resort could provide lodging for 45 people. There was a putting green, shuffleboard court, and areas to play badminton, croquet and horseshoes. Schmitz Gazebos was an official AAA resort with George as the genial host who made sure their “Recommended by Duncan Hines” title was maintained! Irene made sure each room was immaculate, and helped pack boxed lunches for those making excursions around the peninsula. Baldy Bridenhagen, former sheriff for Door County, was one of the bartenders along with other locals who helped make Schmitz Gazebos such a success for 37 years. George Schmitz died in 1965 and Irene sold the property. Albert Wild, an international attorney from Chicago and Baileys Harbor, purchased the 60-acre tract of land and began construction of 14,500 sq. foot main building in 1969. Wild was an ardent Door County enthusiast and it was his intent to keep the project as natural as possible. Whenever feasible, stone and building materials indigenous to Door County were used. Most of the craftsman working on the project were local. Wild also obtained DNR permission to construct piers for yachts wishing to dock at the new Baileys Harbor Yacht Club, and dock they did. “The African Queen”, McDonalds founder Ray Kroc’s “Big Burger” – 65 and 85 footers who would come to the Yacht Club because it was the most beautiful harbor and the finest facility on the Michigan side. Guests entering the foyer of the Club were drawn to the slate fireplace in the lobby. The cocktail lounge with its sunken bar adjoined a glass-walled patio area overlooking the waters of Baileys Harbor. Formal dinner attire was required. One of the most distinctive features of the facility was the wrought-iron circular staircase modeled after the one in the old lifesaving station that stood on the original site. The staircase was 65 feet high with an observation area at the top offering spectacular view of the bay and nearby Ridges Sanctuary. When the facility opened in 1970, it was recognized as one of Lake Michigan’s most elegant resorts and through the years had earned a reputation for its fine dining, docks and lavish lodging. It was the site of numerous county benefit events including the popular Pirate’s Cove fundraisers for United Way of Door County. In the late 70’s, amenities and new housekeeping cottages were added when the new owners, Joe Smolenski, and his brothers, took over the Club’s operation and created better docking facilities for charter and sports fisherman, complete with dock master. New advertising added hustle and bustle, and condos were built, including Ray Kroc’s helicopter pad. They changed the configuration and use of the dining rooms as well, and a Sunday Brunch was added which was so successful that the wait to enter was sometimes as much as an hour and a half. The torch was soon passed to a new owner, Maureen Kelly in 1982. She infused new life into the Club with her personality and made each person feel they were her special friend. There was dancing and the greatest entertainment parties on the peninsula. She sought to make county residents feel welcome at the resort and opened the facility for benefits such as the auction for the Wisconsin Children’s Program of Northern Ireland, and hosted the popular “Irish Fest” weekend over Labor Day each year. The music group Blarney wrote a song “Sailing into Bailey’s Harbor” especially for their appearances at the event. Maureen remodeled the bar, and the best free entertainment – the “locals”, would get together and try to out sing each other to everyone’s delight. She also significantly expanded the marina with construction of new 24 to 40 foot floating piers, and new lodging was built (named Christina after Maureen’s daughter). Maureen’s dream was shattered however when sewer construction on Ridges Road and the inaccessibility of the Club, along with other problems, moved the ownership into the hands of the Bank. In 1989, Blue Sky Harbor, Ltd., a Wisconsin partnership, became the new owner. They added The Admiralty Room for formal dining fare and service while the Bosun’s Mate dining room was designed for light dinners and casual dining. On February 16, 1993, two devastating fires destroyed the Yacht Club – a total loss. Plans to rebuild were never approved. The Baileys Harbor Yacht Club Resort, as we know it today, was built in several phases after the main building, lobby, swimming pool and first 22 units were completed. My great uncle, Jac Schmitz, would be pleased that so many people are still enjoying the beauty and magic of his vision from over a century ago.